How cool would you be driving in one of these. Seasick Steve has one and reckons he won't part with it any time soon. 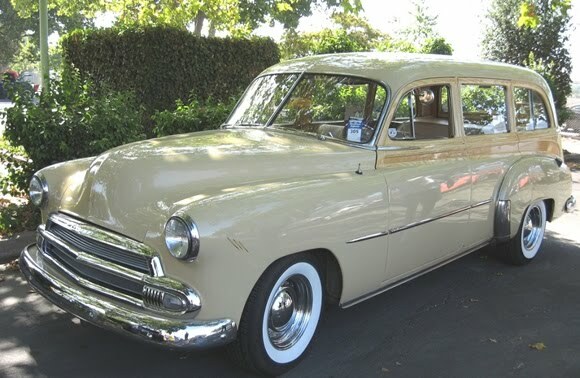 The 1951 Chevrolet Station Wagon had a wood like finish around the windows and body line. Chevrolet wanted to combine the 'smartness and distinction of a wood grained finish with the strength and safety of an all steel body'. Woohoo! However, that meant the '51 was quieter, more durable and a lot easier to keep shiny and new. Plus it had seating for eight with rear seats that could be readily removed for more luggage space. A great example of beautiful motoring. what a difference in the two! I'm looking for a 51 now to restore. If you come across one, please let me know.